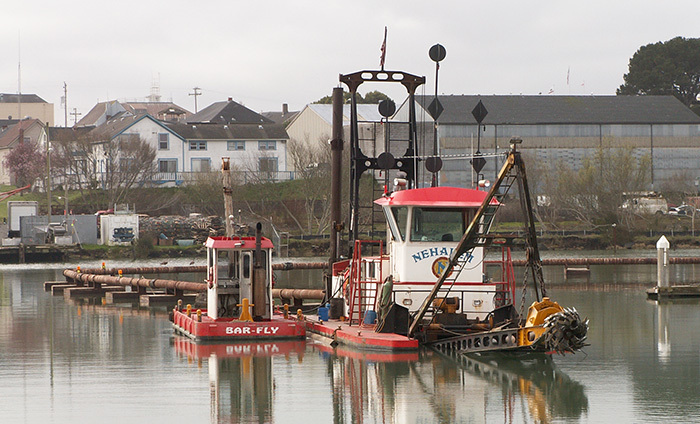 It’s a race against time on Humboldt Bay as two separate dredging projects battle the elements so both finish before an Oct. 15 deadline, according to harbor district and city of Eureka officials. Sediment is set to be removed from near the Coast Guard Station Humboldt Bay boathouse at the south end of the Samoa peninsula before work is done at the Eureka Boat Basin near the Wharfinger Building. Sediment brought up from the bottom of the bay will be dumped in the Pacific Ocean about 3 miles west of the Humboldt Bay entrance — known as the Humboldt Open Ocean Disposal Site, or HOODS. Time for a Plan B. Back in March, Eureka Parks and Recreation Director Miles Slattery outlined a plan for where to put the sediment that has accumulated along the bay floor at the Woodley Island Marina and Eureka’s public marina. Both the City of Eureka and the Humboldt Bay Harbor, Recreation and Conservation District had agreed to pursue a plan to deposit the sludgy dredge spoils on a beach on the Samoa Peninsula. That’s where such materials have been deposited for decades, including last time the marinas were dredged, back in 2007. But yesterday, in a conference call with staff from the Harbor District and the City, officials with the Environmental Protection Agency rejected that plan in no uncertain terms. Dredging of Humboldt Bay has become an undeniably urgent matter, and Samoa Beach has been proposed as the best disposal option. We support dredging the marinas and agree that it is urgent, but dumping on one of our most popular beaches would impact public access and create visual blight. Attend this public meeting to support alternative options to dumping on Samoa Beach. May 3 at 5:30 pm at the Wharfinger Building, 1 Marina Way in Eureka.